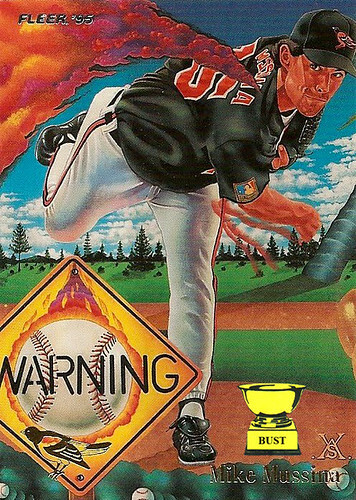 WARNING: Lava in the shape of a stoned crow will threaten Mike Mussina. WARNING: Skin will start to fall off all Orioles pitchers' arms. WARNING: A sea of water and baseballs opens up below the pitcher's mound. WARNING: An athletic pitcher will develop a massive beer gut in this illustration. WARNING: Baseball field has morphed into a national park. WARNING: Giant alien's leg has mysteriously entered the card. WARNING: Stenciled street signs depict giant flaming baseballs hitting black-and-orange birds.